Kratina Ceremony – Wat Thai Washington, D.C.
During the rainy season of each year, the Lord Buddha established the Buddhist discipline called Buddhist lent, during which every monk stayed overnight at the same temple for three lunar months to study and practice the Dhamma intensely. After the end of the Buddhist lent, the Kathina Day festival is the next great festival to be held at each temple. All Buddhists believe that this is the biggest merit-making ceremony. The donation for Kathina Day is quite distinct from other kinds of donations due to the limitation of time to make it, within one lunar month after the end of Buddhist lent only once a year in each temple. Monks qualified to get the Kathina yellow robes have to keep staying overnight at the same temple three complete lunar months. Furthermore, the Kathina ceremony can only be held in a temple having at least five such monks. Offering Kathina yellow robes can not be specified for individual monks but has to be done as a Sanghadana, an offering for the whole group of monks. Moreover, all monks in the ceremony have to complete the ritual of Kran Kathina within the same day. 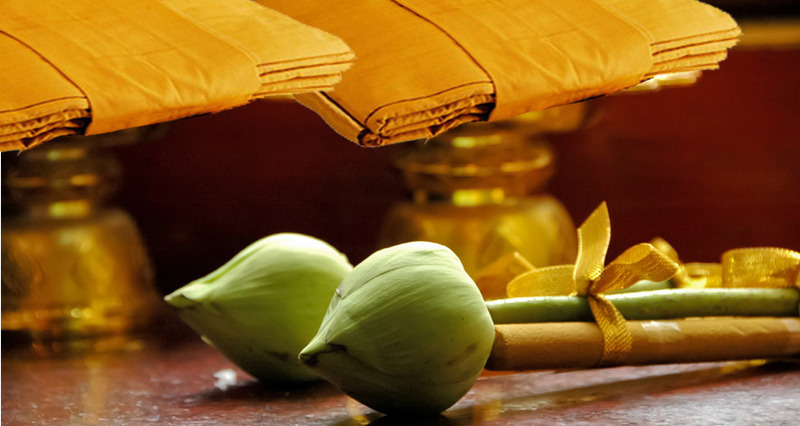 Offering Kathina robes has taken place since the lifetime of the Lord Buddha. The main difference between the Kathina donation and other ones is that the latter were initiated by Buddhist lay people who asked for permission from the Lord Buddha, whereas the Kathina donation was initiated by the Buddha himself without his being requested. This donation stemmed from his desire to provide appropriate living conditions for his disciples. Back in the Buddha’s lifetime, thirty monks from a city called Pathaiyarattha were going to meet the Lord Buddha at Chetawana Temple. However, they could not reach it in time as they wished because it was the beginning of the Buddhist lent. So they had to stay at the city of Saketu for three months. At the end of lent, they quickly traveled to their originally intended destination. Their cloths became soaked and worn out due to the rainy and sunny weather on the way to the Chetawana Temple. When the Buddha saw the condition of the monks, he allowed for the first time qualified monks as mentioned above to be offered new yellow robes by the lay people. This was the beginning of the Kathina festival, and the practice has been carried on ever since. 1.) Kathina is the name of the wooden frame used as a tool to stretch out a piece of cloth before sewing or tailoring it to make a new robe. Because of the unique style of the robe, it is very difficult to make a new robe without that tool. In the modern age it is not difficult to make the robe, as it was in ancient times, so the kathina is not needed. Nonetheless, any new robes for the Kathina ceremony are still called kathina robes. 2.) Kathina is the term for any piece of cloth offered to the monks to make new robes with the tool called by the same name. According to the Buddhist discipline for monks, each piece of cloth is big enough in size to make only one of three kinds of robes: a sabong, a skirtlike lower garment for the monk; a jiworn, the outer robe or gown; and a sanghati, a yellow piece of cloth the same style as the jiworn worn by the monk as protection against cold, or folded and brought over the left shoulder. Nowadays, lay people like to offer monks a combination of those three kinds of robes made by a tailor. Thus there is no need today for monks to make new robes themselves. 3.) Kathina is the name of the merit-making occasion. The Kathina ceremony is held once a year at a temple where there are at least five monks who have followed the principle of Buddhist lent for three complete months. Then they have the chance to get new robes to replace the old or worn ones. In Thailand the lay people like to add the Thai word tord before kathina to form the expression tord kathina. Tord means offering robes by placing them in front of monks without handing them to specific monks. It also denotes that the robes no longer belong to anyone and that the monks have to deal with them later. 4.) Kathina is the name of the clerical ritual. In the Kathina ceremony the clerical ritual involving the monks’ chanting and asking for the unanimous agreement to let one of the monks get the Kathina robes is called Kran Kathina. This ritual must be finished on the same day as the lay people donate the Kathina robes. The monk chosen to be the one receiving the Kathina robes is considered as the most perfect one, the one who has studied and practiced the Dhamma hard during the three-month Buddhist lent. His knowledge and abilities are so distinguished that every monk realizes this fact and admires him. It might be that the monk chosen to be the receiver is the one wearing the oldest robe. When the ritual of Kran Kathina is finished, not only the chosen monk but also all the participating monks and sponsoring lay people get the benefits and merit. 1.) The first type is the Kathina Luang, or Royal Kathina. This is comprised, first, of the Kathina Sadej Phrarajadamnern, the Kathina ceremony that His Majesty the King holds himself or orders his representatives to hold at royal temples. Secondly, the Kathina Ton is the ceremony the King holds himself as he desires at royal or public temples. Thirdly, the Kathina Phrarajadana is the ceremony some governmental organizations, business persons, merchants, or lay people hold, as approved by the King. In this case, the ceremony is held at royal temples using royal Kathina robes requested from the King. 2.) The Kathina Rart (Kathina Ratsadorn), or public’s Kathina, is the ceremony held by any lay people at any public temple. It includes, first, the Maha Kathina, a ceremony with a variety of plentiful donations; and secondly, the Jula Kathina (called the “urgent” or “little” ceremony due to the limitations of preparatory time), usually held at the full moon day of the twelfth lunar month, the end of the Kathina festival according to the Buddhist discipline. 1.) They can travel without informing any monks and receive no punishment for doing so. 2.) They can travel without carrying a total of three pieces of the yellow robe and receive no punishment for doing do. 3.) The monks can join the meal as groups and receive more food after they have started eating and receive no punishment for doing so. 4.) They can keep the yellow robes which are supplements for their regular robes for up to four months. 5.) They can also expand the time restrictions for dealing with the yellow robes offered by the lay people until the middle of the fourth lunar month. 1.) They will be wealthy and prosperous in their lives and at their jobs. 2.) Their minds will be pure and clear enough to become enlightened very easily through meditation. 3.) They will be in heaven after death. 4.) As a result of offering robes, they will never be lacking in clothes but rather have many beautiful and elaborate pieces of clothing.